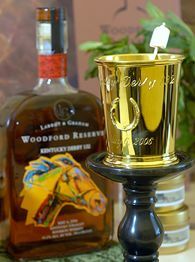 At my first Derby in 1997, I tried a mint julep and was quickly hooked. 1 part sugar-water, 2 parts bourbon, poured over crushed ice with a giant fresh mint sprig, it is pure magic. It was $5 and you got to keep the cool glass which has the logo of that year's Derby on the front and lists the winner of every derby on the back. Since then they have gone up to $6, $7, and last year up to $8, which I thought was kind of pricey, but they taste great, they're fun to collect, and it's Derby Day after all, so what the hell? This year as I sip on my sure-to-be-now $9 Juleps, I will laugh at all of the wankers who lay down $1000 for a mint julep. I can't slam it completely because they are donating the money to a good cause, which hopefully will help prevent former champion horses being sold to Asian slaughterhouses, but a cool grand for a drink that is 75% ice is just silly. The funny thing is that people with way too much money will buy these things, so that everyone within eyeshot will know how rich (and foolish with their money) they are. 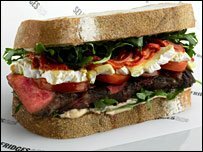 If they really want to impress their uber-wealthy friends, they should fly first class to London just to order the recently launched "World's Most Expensive Sandwich" for 85 pounds (approx. $157). $157? Can I make it a combo for $158.95? In honor of the Derby, here's something for ya. I especially liked the Rudy soundtrack. Normally I don't follow horse racing, but that just transcends all sports. I don't know why, but it does. Here's hoping we see something as inspiring again in our lifetime. That day Secretariat ran the mile and a half in 2.24 flat, a full TWO SECONDS faster than the 2nd fastest Belmont ever (Easy Goer, 1989, 2.26 flat) - it is still the all time world record for a mile and a half on dirt by any horse. He still holds the record for fastest Derby and Belmont in history, and the only reason he doesn't still hold the Preakness record is because of a timekeeping error that gave him a bogus time (then a track record, but since surpassed). I don't think we'll ever see anything like that again, but you never know. You can take that mak it a combo shite somewhere else. I flashed back to beeing tired, drunk, hungery and as pissed at you as I have ever been. That's all I got to say about that. I will cry 5 min before Derby 132 as I have every year for the last 20 years. You don't know the power of "Weep no more my lady." untill you hear it sung by 150,000 folks. Lost in how great Secretariat is was just how great of a horse Sham was. Sham only ran the second fastest Derby time ever. Same goes with Alydar because of Affirmed really. Only less so.